Small yellow spots will start to appear, followed by a white or off-white, powdery coating in patches on leaves (usually on the upper surfaces), then spreading to eventually cover the entire leaf. The foliage will become dull and slightly yellowed and will wilt in afternoon heat. The leaves may become tattered and frayed as the disease progresses. 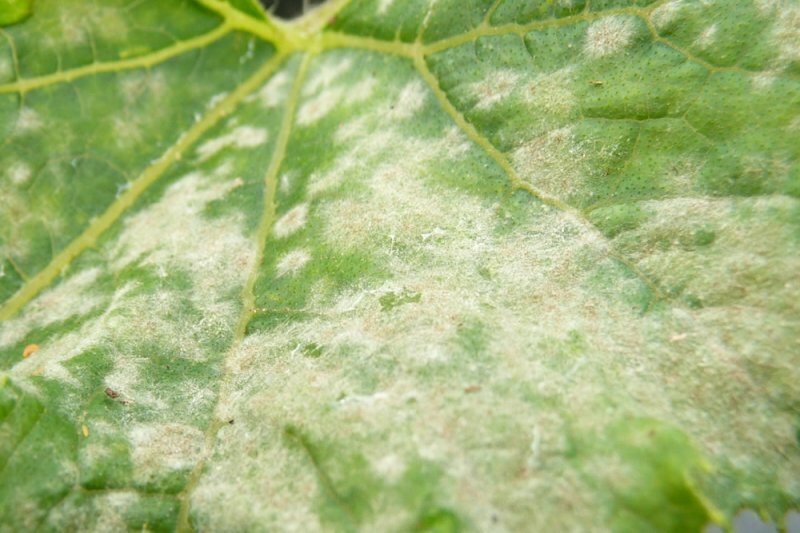 As the mildew spreads it will kill individual leaves and, in severe cases, the entire plant. Fruit production will be poor due to the reduced leaf surfaces available for photosynthesis. Affects cucurbit plants including courgettes, marrows, pumpkins, squash, gourds, cucumbers and melons (although it is less common on watermelons). It’s most prevalent in summer. In very wet seasons it is less likely to be a problem as it prefers dry and warm conditions. Ensure good ventilation in glasshouses and spread plants out (both indoors and outside) to maintain the air flow between them (high humidity increases the growth rate of the fungus). Ensure that plants are well watered and mulched (though don’t allow the mulch to touch the stems) to prevent the dry conditions which this disease prefers. Water plants from ground level, as using overhead watering can splash the fungal spores between leaves and plants. Clear up all the plant debris in the autumn to get rid of any overwintering spores. 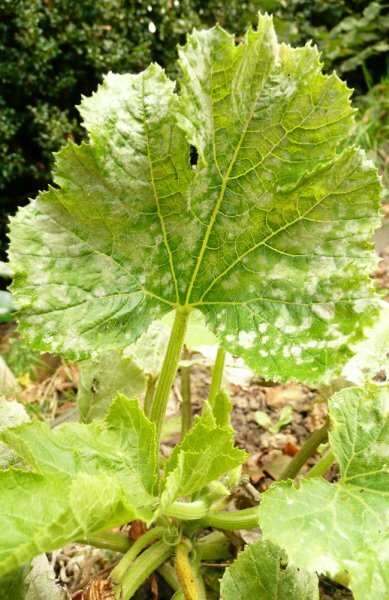 Some varieties, particularly of courgette, claim to have resistance to powdery mildew. The fungus overwinters in plant debris so good hygiene practices (removing and destroying plant debris in the autumn) should prevent repeated outbreaks. The most common fungi causing this disease are Erysiphe cichoracearum and Podosphaera xanthii (which is also called Sphaerotheca fuliginea).